We invite submissions for paper and poster presentations on any area of geoarchaeology, from landscape to artifact characterization. Submissions which integrate multidisciplinary scientific analysis with robust archaeological interpretation are especially encouraged. Oral presentations will be allocated 20 minutes. 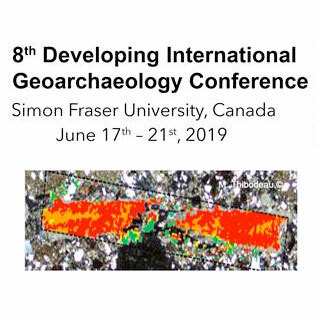 If interested, please visit the conference website, fill and send the Abstract Submission Form to dig2019.sfu@gmail.com before April 15th, 2019. Please also follow us on Twitter. Developing International Geoarchaeology (DIG) is the title of a series of very successful international conferences. The goal of DIG is to bring together a wide variety of international researchers, practitioners and students in this diverse and interdisciplinary field to facilitate discussion, stimulate research, and promote international scholarship in geoarchaeology. The conference is biennial, having first been held in Saint John, New Brunswick, Canada 2005, followed by Cambridge, UK, McMaster University, Hamilton, Ontario, Canada, University of Tennessee Knoxville, USA, University of Basel, Switzerland, Alghero University in Sardinia and Newcastle University, UK.